The Blue Business Plus Credit Card from American Express currently has an Informr score of 9.1 out of 10. This score is based on our evaluation of 12 sources including reviews from users and the web's most trusted critics. 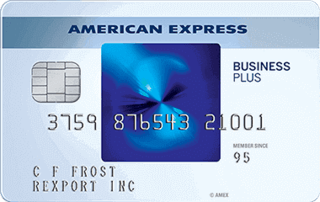 Blue Business Plus Credit Card from American Express is typically available to those with good credit scores (650 or greater). Ideal for smaller businesses and frequent fliers, the Blue Business Plus card stands out from the competition by offering a solid 2-point bonus on every purchase, a flexible credit limit and a transfer program that lets you pool your rewards with other travel loyalty programs. The Blue Business℠ Plus Credit Card from American Express is a good choice for business owners who want to earn points on all of their purchases AND enjoy a long 0% intro APR on purchases and balance transfers. While the Blue Business Plus doesn't offer a welcome bonus — unlike other American Express business cards like AmEx Business Platinum - the Blue Business Plus offers a very competitive 2x points per dollar easily worth as much as 4% cash back when you use your points well. The card has few downsides, particularly as it has no annual fee. If you want AmEx benefits and reward points with no annual fee, this is one of the best ways to do it. It’s a bummer that the card doesn’t offer a welcome bonus, but its industry-leading return of 3.8% on the first $50,000 spent each year makes up for it. Depending on the types of purchases your business makes, it might make sense for you to pair this card with one which offers bonus categories, such as the Business Gold Card, to earn the highest rate of return on all of your spending. For a small business owner who wants to make a large initial purchase or make a balance transfer from another card, the intro APR on purchases and balance transfers of 0% for 15 months that the Blue Business Plus Credit Card offers could help. It can be especially useful if your business’s cash flow isn’t well established just yet. The Blue Business℠ Plus Credit Card is a good option for firms with irregular cash flow, that want a no-annual-fee business credit card. If you’re more concerned about cash back or rewards, we recommend looking at other options instead. With allowed spending above your credit limit, you have the flexibility you need to make decisions on the go for your business. The new entrepreneur or small business owner could find this card fits perfectly with their needs. With The Blue Business℠ Plus Credit Card from American Express, you will enjoy a 0% intro APR on purchases and balance transfers for 15 months (12.74% - 20.74% variable APR thereafter) of account opening. This could be an advantage for your business if you need to make big purchases during the first months with a low introductory APR since you won't have to pay any interest on purchases during that period. This card has no annual fee, and a very simple rewards structure. That makes it a great fit for business owners who want to earn rewards without thinking too much about specific bonus reward categories. The Blue Business Plus Credit Card from American Express is a great tool for anyone that spends up to $50,000 a year. The 15 months of interest free purchases is icing on the cake. Double points on every dollar spent is as good an offer as you’ll find on any business credit card. All of these benefits are available with no annual fee.